ORLANDO — The last time The Bowerman Award was handed out at the Orlando Grande Lakes Resort, Derek Drouin and Brianna Rollins were honored as the most outstanding male and female athletes in collegiate track & field. That came back in 2013. Fast forward three years and both of their lives changed in a major — dare we say, golden — way. Back in August at the 2016 Rio Olympic Games, both Drouin and Rollins won gold medals. Drouin posted the only clean sheet through 2.38m (7-9 ¾) in the high jump to win that event, while Rollins crushed the field in the 100 hurdles (12.48 to the runner-up’s 12.59) to lead an American sweep. Those gold medals, coupled with the two that 2010 The Bowerman Award winner Ashton Eaton won in his legendary career thus far, gives a total of four. Eaton also has two world records to his name, one in the heptathlon and another in the decathlon. 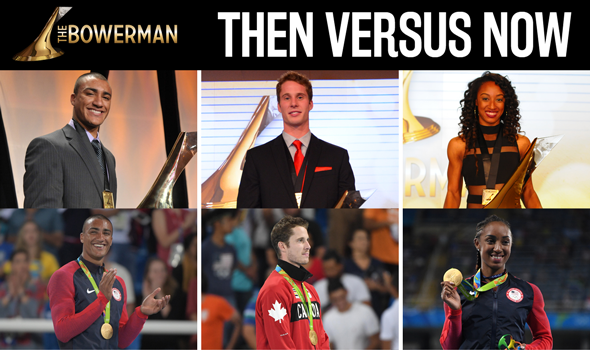 There are now just four days left until we find out who wins The Bowerman Award in 2016. The male finalists are former Texas A&M standout Donavan Brazier, Oregon distance star Edward Cheserek and former Arkansas dynamo Jarrion Lawson. Finalists for the women’s award are former Texas quarter-mile phenom Courtney Okolo, Georgia’s American-record-holding triple jumper Keturah Orji and Ole Miss’ shot put sensation Raven Saunders. You can watch The Bowerman Award Ceremony LIVE, exclusively on FloTrack beginning at 7 p.m. ET on Friday, December 16.